The Italian Government yesterday decided that the Costa Concordia will be towed to Genoa, Italy from its current position on the Italian island of Giglio. The Concordia wreck will be towed by Titan Micoperi which is the same company that’s floating Concordia in preparation for the tow. The company will tow the ship 219 miles to the Port of Genoa shipyard Voltri, the average speed of the tow will be 2 knots and will take 4 days to complete. “The cabinet’s approval of the project for transportation of the Concordia to Genoa for dismantling and recycling means that Achievement of the goal we set ourselves 2½ years ago — namely, the safe and definitive removal of the wreck from Giglio Island — is now well within sight,” said Costa Crociere CEO Michael Thamm. “We are now just two weeks away from refloating the ship. 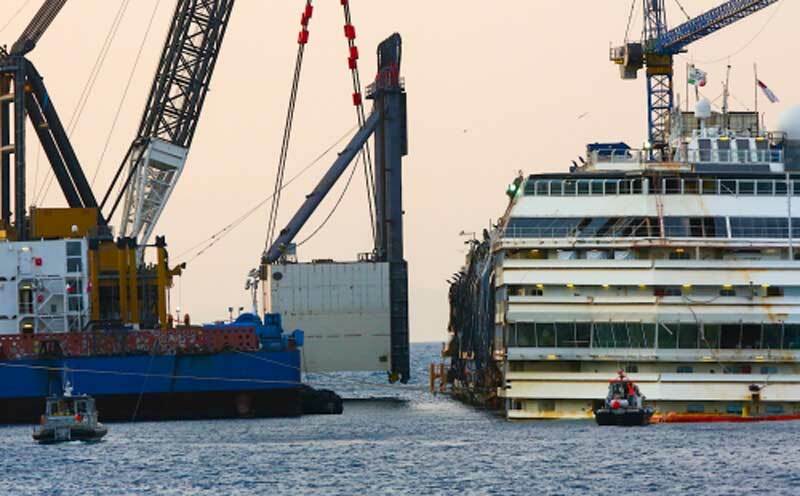 At the moment Titan Micoperi engineers are working flat-out around the clock to fit the Costa Concordia wreckage with the final 2 sponsons so that the ship can be refloated in preparation of the tow. In total there will be 30 sponsons fitted to the side of the wreckage. Refloating of the ship is set to begin by mid-July and then the towing operation by the end of July. Once Concordia is on route to Genoa it will be supported by several other marine vessels to help if any problems arise. The weather will also be a huge factor and could cause delays to the operation. Phase I: The Port of Genova Voltri will be readied to receive the vessel and perform initial ship breaking activities including stripping of the interior furnishings and fittings on the decks above water. Phase II: The wreck will be transferred from the Voltri Breakwater to the Molo Ex Superbacino dock, where the structures of decks 14 to 2 will be dismantled. Phase III: Will consist of preparatory activities for transfer of the wreck to Dry Dock no. 4. At this stage the sponsons will be removed and the food storerooms and cold storage rooms on Deck 0 will be cleaned. structures. This phase will conclude with appropriate handling, disposal and recycling of the discarded materials. The Costa Concordia wreckage could have have been towed to the nearby port of Poimbino in Tuscany which Cruise Hive previously reported on. According to the Italian Emergency Commissioner Franco Gabrielli it’s closer to the island of Giglio and there would be less of a threat from the weather. More details will be released in the coming days by Costa Cruises and other organisations involved. This will be one of the largest of its kind in the world and Cruise Hive will continue to follow the developments.